I bet you thought there were two names for this grape varietal - pinot gris and pinot grigio. There are actually 16 ways to say pinot gris. I once read pinot gris came about from a cross between a chardonnay grape and pinot noir grape. Perhaps some one else can confirm if there is any truth in this. Mouth: Sweeter than most. Try it alongside a T'Gallant Juliet Pinot Grigio and it will be obvious. Buy: This bottle was a gift from a friend at the winery , but retails around NZ$18. Check here for a distributor near you. Verdict: So easy to drink even my mother would enjoy it. Bloggers under 35 should serve it to their grandmothers - they'd love it. 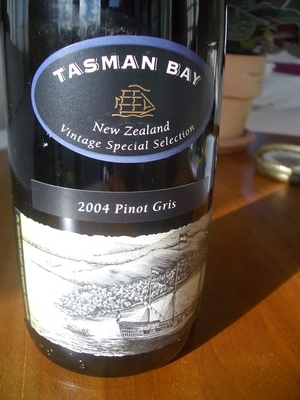 Trivia: Pinot Gris grapes were first brought into New Zealand by the missionaries in the 1800s. Thank you to Alice at My Adventures in the Breadbox the host of this months Wine Blogging Wednesday. Check out her blog in a couple of days for her roundup. Kingsley looked at me a little oddly when I said I was looking for a Rosé wine. 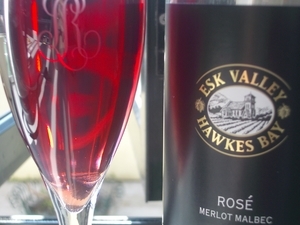 He politely informed me, that here in Auckland, we stop drinking rosé at the end of March and pointed me in the direction of a meagre collection of lonesome rosés - a couple of Spy Valley , a few Ata Rangi ....and what have we hiding at the back - an Esk Valley. Not just Hawkes Bay's finest, but New Zealand's finest Rosé, Kingsley informs me. I was won over as soon as I saw the grape varietals were actually listed on the front of the bottle and not hidden away in the fine print on the back. Legs: Longer than Mel, shorter than Elle. Mouth: Fruity, some spice, crisp finish. Pour me another please. Food: Perfect with our chicken salad at lunch. Buy: NZ$19.95. Check here for international distributors. Verdict: Nice, but not as good as my favourite rosés from Western Australia. Trivia: Not one New Zealand rosé has ever been awarded a gold medal. On March 5th 2005 Greg Trott passed away after a long battle with cancer. Greg Trott was the force behind Wirra Wirra wines in Mclaren Vale, South Australia. It seemed fitting the first bottle of wine I would taste following my completion of chemotherapy should be something he had a hand in. A few years ago I started to collect Wirra Wirra The Angelus with the plan of a "vertical tasting" to celebrate some future birthday ending in a zero. The Angelus is a blend of cabernet sauvignon grapes from the McLaren Vale and Coonawarra regions of South Australia. My oldest vintage was the 1997 and that was the one we opened. Greg Trott's view on back labels is very simple - Never tell someone what they will taste. For one, taste is very personal and everyone is different. Secondly, the flavour of wine evolves in bottle over time, so how can you accurately describe something on a label when it will inevitably change? .................I won't describe how it tasted but will say it was "so damn good". The Angelus has been replaced by the Wirra Wirra Cabernet Sauvignon. Hitting the bottle should be one of life's simple pleasures so why do men make it so bloody complicated? I was so very glad to hear that women are fuelling the new boom in UK wine sales. Having contributed to the spiralling sales figures substantially, I was hardly amazed by the news that me and my sort downed nearly 600 million bottles of fermented grape last year (compared to the paltry 400 million consumed by our male equivalents). But I was definitely gratified by the indisputably official nature of the stats. This is because I believe that wine is the rightful property of the ladies. Never mind Sideways. Never mind ‘emotional connections with Pinot’. Never mind that the vast majority of vintners and tasters and sommeliers are men. Men spoil wine. They take it too seriously. They want to master it. They want to dress it up in mystery and tradition, and imbue it with intrinsic maleness so that they can be superior about it. Men reach a certain age – 34 or so – and stop thinking they know how to play the guitar, or how to DJ, and start thinking instead that they ‘know’ wine. They stop default-ordering the House option in restaurants, and start asking for ‘the list’. They start thinking stuff is corked. They start believing that creating a big fat scene about the suspected corking, will prove how jolly Alpha and male they are. They hold forth at length about how they despise Pinot Grigio because it ‘doesn’t taste of anything much’. Men don’t understand that wine is not about this. Wine is actually just for the drinking, and for the being drunk. That’s why it was invented. Men want to take the joy out of wine, and replace it with snobbery, superciliousness, and another opportunity for sexism. Women, on the other hand, just want to drink it until they feel like singing Wichita Linesman, crying, and/or texting someone they shouldn’t. There now follows a thinking girl’s guide to buying, drinking and properly enjoying wine. 1) When choosing a bottle, ask yourself the following questions: red or white? (Your response will be primarily influenced by how badly red stains your teeth); should it cost more than six quid in a shop, £12 in a bar? (Yes, probably. There’s not being snobby, which we approve of, but there’s also being tight, which we definitely don’t approve of); does it have a funny name, something that you can make increasingly slurry jokes about over the course of an evening? (I like the Californian Tierra Area for this, because it sounds like Tina Arena who sang Chains, which I too like to sing when under the influence, along with You’re So Vain and, of course, Wichita Linesman. 2) Three ‘new standard’ 175ml glasses qualify as an official binge drink. I support binge drinking as a statement of post-feminist empowerment, so you should see this as an aim, rather than a limit. 3) A lady will always get more drunk if she goes for ‘just one’, than if she accepts she’s there for the long haul. This is because Just Oners turn down offers of stomach-lining chips and hummus dips on arriving at bars, on the basis that they’re ‘about to get a bus at any moment’. They’re not. 4) Vodka removes red wine stains from off-white sofas, carpets, and lovely eau de nil jersey cocktail dresses much more effectively than either salt or soda water. 5) There’s absolutely nothing wrong with liking either Chardonnay or Pinot Grigio. They’re both very pleasant but were cast out to the hinterlands of fashionable drinking by men because ladies liked them, which instantly made men think they couldn’t be good. It’s time to reclaim them. 6) Same applies to rosé. Men think it’s crap, because it’s pink. It’s actually distilled essence of very nice summer holiday. 7) Sea sickness pills ease hangovers. 8) This summer’s wedge is a good wine-drinking shoe. It has flattering, calf-elongating properties, and provides useful stability that standard high heels do not. 9) It is not at all bad to pop out for a last-minute bottle of Wednesday Night Red, dressed only in pyjama bottoms, Uggs and a Parka. Au contraire, it is charming, devil-may-care and rather French. Boyfriends who say, ‘You look a bit mental,’ are wrong. 10) Wine is not an intellectual pursuit. It is for fun. As I drove into my supplier First Glass in Takapuna the signs promoting Petite Verdot had me considering the varietal as rare and maybe worthy of this challenge. However I once fell in love with an Aussie Petite Verdot called McGuigan. That gold medal winner and I spent an entire winter together so I feel I know it a bit too well to call it rare. I came home with the lonely bottle of durif lurking on a shelf all by itself between cabernet and merlot - a Morris Durif 2000 from the Rutherglen region of Australia. Within Australia durif is also grown in the Riverina area .....and Vale wines on the Mornington Peninsula have experimented with a cool climate durif. They have produced a more elegant style of red wine with less ripe fruit, less tannins and high spice flavours, not dissimalar to a cool climate shiraz. In California there has been some confusion over what is durif and what is petite syrah. Google both names and you will finds many sites devoted to the confusion. For the best explanation read the report written by Dennis Fife of Fife Vineyards. Durif was developed inthe late 1800's by a Dr Durif when he crossed a syrah with a peloursin . In Australia the CSIRO has used DNA fingerprinting to prove the clones imported into Australia are definitely durif. Because Dr Durif was from the Rhone region I thought I might search Anne Willan's French Regional Cooking book for a matching meal. As nothing from the Rhone section appealed to me I decided to make a casserole using beef, onions, garlic, eggplant, zucchini, tomato and red pepper - a sort of beef with ratatouille. Although the durif would be served with dinner I opened the wine around lunch time to try it. There were some left overs from my Paper Chef #4 entry and I wondered how the durif would go as a match. Pretty darn good actually. I was disappointed with the lack of fruit aromas when first poured. However the wine had some really nice vanilla oak smells . When I sniffed the empty glass a little later I could smell coffee, chocolate and some blackcurrant. It has reasonable legs, and as expected the colour was an intense purple. Soft tannins (it was a 2000 vintage) made it very drinkable but the tarish aftertaste was not pleasant. Staying with the French theme maybe some Serge Gainsbourg would be a suitable match for this wine. This durif has sparked my interest and I will search out others. I'd be interested in trying a de Bortoli from the Riverina region. My thanks to this month's host Spittoon - go to his site to check out the other entries.